The 2016 Spark catalogue is now online – and boy, does it have some nice items in it! There are lots of new modern and ‘classic’ F1, LeMans, USA sports cars and Indycars, plus Can-am, rally and luxury road vehicles. Spark also now have MotoGP and a 1/87 scale range. View the 52-page document by clicking HERE. 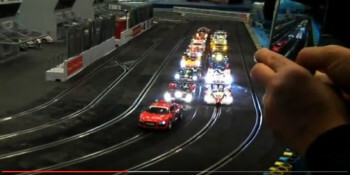 A 24-hour slot car race on a huge multi-lane LeMans replica Scalextric track, set up in a gymnasium. Spectacular!